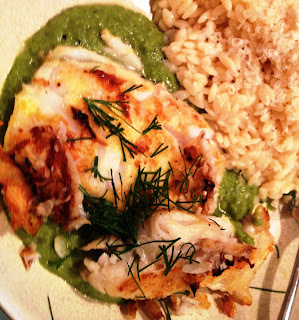 Sprinkle cod evenly with mustard seeds and let marinate in the refrigerator for 2 hours. Meanwhile, heat butter in a 10″ skillet over medium heat. Add shallots; cook until soft, about 5 minutes. Add peas, 1 cup water, and salt and pepper, and cover partially with lid; cook until sauce is reduced, about 10 minutes. Set sauce aside and keep warm. Purée ¾ of the peas, half-and-half, and salt and pepper in a food processor; transfer to a 2-qt. saucepan and keep warm over low heat. Heat oil in a 12″ skillet over medium-high heat. Add cod; cook, turning once, until golden brown, about 4 minutes. Season with salt. 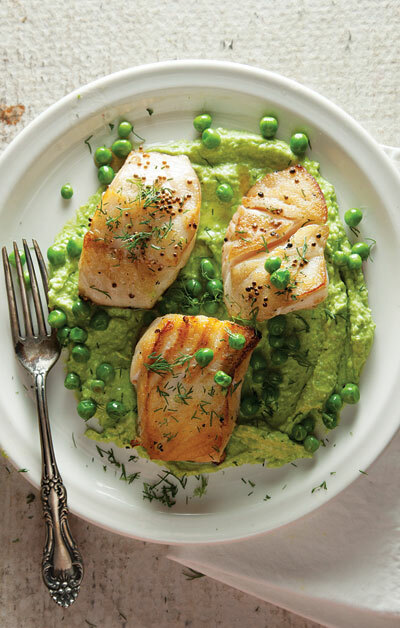 Divide pea purée among 6 serving plates and top with cod; spoon over sauce and garnish with dill.